ATCHISON — When Olivia Pennington can’t sleep, her dad has the perfect remedy. “He’ll come in and tell me a story about a princess named Olivia with her little sister Abigail and her mom and dad who always protected them,” said Olivia. “It just makes me feel safe,” she added. Thomas Pennington protects more than his princesses in Atchison. He and Michael Galley, his childhood friend and fellow Atchison resident, have served in the U.S. Army for over two decades. Both families have experienced three deployments in five years. Sarah Galley and Shannon Pennington have their hands full. Sarah is raising her daughter Avery, who is in kindergarten. Shannon is raising her daughters Olivia, who is in fifth grade, and Abigail, who is in kindergarten. All three children attend St. Benedict School in Atchison. For large chunks of time, the women are raising the kids on their own. “We’re atypical military families at this point because we are part of the community,” said Sarah. “We don’t have the soldiers living next door, the other military spouses to vent to. It’s got its pros and cons,” she said. Michael has served in the Army for 29 years and Thomas has served for 20. Michael is currently deployed in Djibouti, Africa. Thomas arrived back home Sept. 16 from his deployment in Bulgaria. 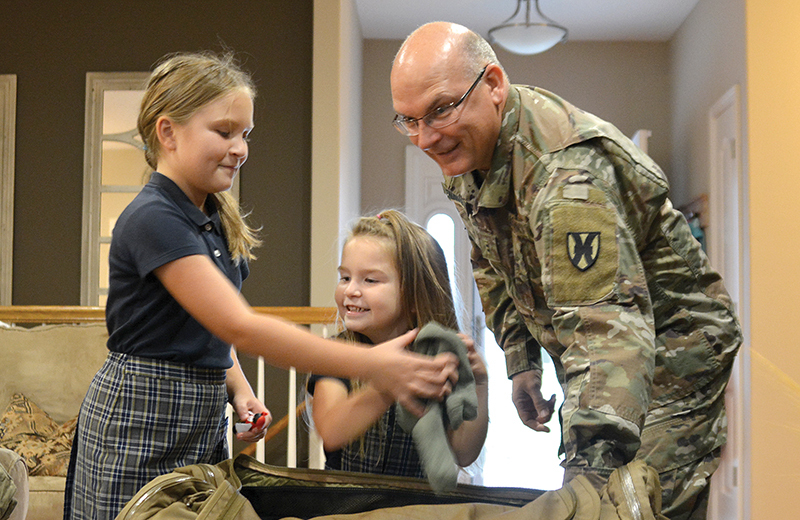 “Being deployed with a family is difficult because you still have all the normal life issues to deal with at home while trying to focus on the mission overseas,” said Thomas. “He’s missed more birthdays and anniversaries than he’s been around for,” said Shannon. The Galleys have had a similar experience. “I have missed out on a lot of family life — birthdays, holidays and everyday life,” said Michael. Playing those roles isn’t easy, said Sarah. “The struggle to figure out how to be the soft, nurturing mother that you want to be and try to be, but also you have to be the disciplinarian, the voice of reason,” she said. Both women work full time — Sarah as a respiratory therapist at Mosaic Life Care in St. Joseph, Missouri, and Shannon as an accountant for the Archdiocese of Kansas City in Kansas. With long commutes to and from work, they find that coming home with only a few hours before bedtime is a challenge. The women rely on day care providers to care for their children after school until they get home from work. Once everyone is home, it’s not long before they have to start their routines all over again the next day. “You just try to plan as best as you possibly can for what you think you’ll need to do,” said Shannon. Michael and Thomas have been friends since kindergarten. Now, with both serving in the Army, living in the same town, and with children close in age — Michael also has two older children in their 20s — they are closer than ever. But it was when Sarah and Shannon met a few years ago, that their families grew close. “Our daughters have gone through preschool and are now in kindergarten at the same school,” said Sarah. After their husbands growing up together, continued Sarah, “it’s just weird how that worked out. Part of what has made the two women fast friends is a mutual understanding of the military lifestyle. Both can recall leaning on the other several times throughout deployments. “I could say something and I didn’t even have to finish and you knew exactly what I was venting about,” Shannon told Sarah. With afterschool activities, dinner and homework, and only one parent there to make it all happen, the women understand the adjustments it takes to get through the day. The situation has also molded the women’s character. 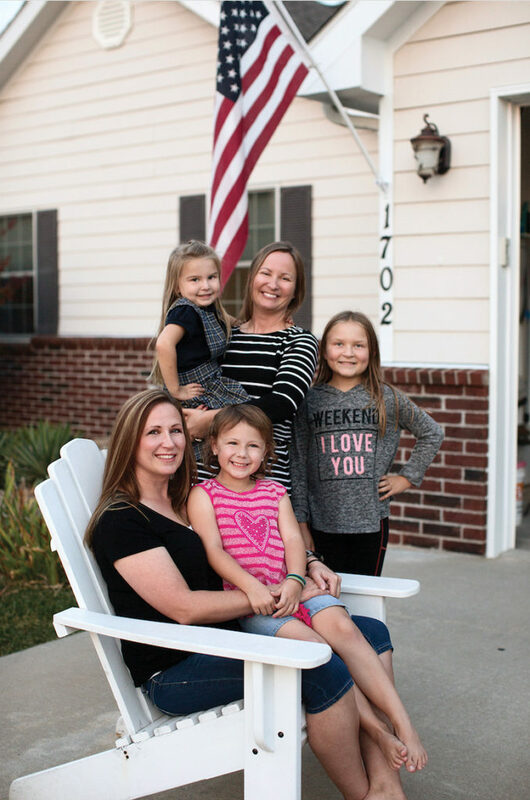 “As military wives, you’re constantly putting yourself on the back burner, regardless of what it may be — your faith, life, sleep,” said Shannon. “It makes you very independent and very strong,” said Sarah. People enter the military for a variety of reasons. For Michael, it was something he always wanted to do. “I knew as a young child that I would join the Army,” he said. “I was always fascinated with military equipment, movies and soldiers. Although times have changed since his dad served, the sacrifices it requires remain life-changing. “Deployments are difficult on marriages in multiple ways,” said Thomas. “However, working through all the challenges together really strengthens the marriage,” he added. Not only have the men missed out on anniversaries and birthdays, they have missed out on some major milestones. Thomas found out about his new baby daughter while in Afghanistan; he didn’t meet her until she was three months old. “We did a lot of Skyping back then,” said Shannon. Now, with FaceTime, email and text, keeping in touch is even easier. The time difference for the Penningtons’ latest deployment was eight hours. The Galleys’ current deployment is also an eight-hour difference. For the girls, growing up without their dads around all the time isn’t easy. “I really miss him so much,” said Abigail. “He’s been gone a lot of times so I can handle it,” said Avery. Avery is used to her dad being home for short periods of time then gone again, said Sarah. For Olivia, the past deployment was more difficult because she’s older and has a better understanding of the situation. “I think about him every day, and it makes the day go by slower,” she admitted. But one feeling overrides the negative ones when the girls think about their dads’ jobs — pride. No moment compares to when their dads come home — which is sometimes by surprise. “I hug him and kiss him!” exclaimed Avery. “He makes me laugh,” said Olivia of her dad. And Abigail enthuses as only a kindergartner can. Arriving home after a deployment is a joyful occasion, but it isn’t a simple one. “It can be strange coming home because, for me, time back home stopped,” said Thomas. “I expect that things would be exactly as I left them. “But obviously that isn’t the case. “It’s strange at first, but kind of fun to see how the girls have changed. “I try to take it slow and be sort of a bystander for a few weeks to learn all the new routines,” he added. The Galleys have a similar strategy. “Coming home after being gone, I have to adapt to the routine and changes that Sarah and Avery have made,” said Michael. “It’s easier for me to sit back and watch their daily routines than me bringing my routine home and installing [it] as the norm,” he continued. The most profound impact has been on their faith lives. Michael’s faith has been challenged by his career. “With the places I have been, the things I have seen and the things I have done — it has tested my faith,” he admitted freely. “But having a strong faith and strong support from my family has made me prevail through 29 years of service,” he added. The Penningtons’ faith lives have also been shaped by their lifestyle. “My husband and I both met in the military — I was in the Army, also,” said Shannon. “Since I have met my husband, there have been so many things that have occurred in my life that only reinforce the fact that it is not my plan that’s happening,” she said. “So for me, [my faith is] stronger than ever, and it reinforces the fact that it can only be divine intervention,” she added. For Thomas, serving the country has strengthened his faith in God. For the girls, however, only one thing matters at the moment: Daddy’s home. “He makes me feel that nothing can really go wrong,” said Olivia.